The evening after Andy and Sugi’s wedding, the newlyweds were off at a family dinner so Tawn and I invited Andy W and Kenny over to our condo for dinner. 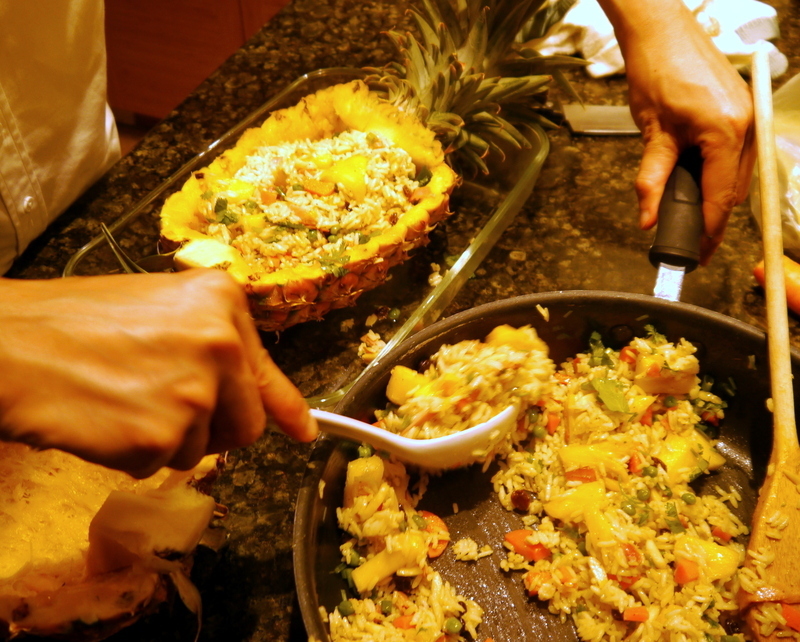 Sugi’s family had sent us home the night before with a pair of very ripe Maui Gold pineapples, so Tawn offered to make pineapple fried rice. Chef Tawn busy in the kitchen. We had to buy a few items such as the raisins, the pack of which I carried with me back to Kansas City to leave with my sister’s family, since the friend we’re staying with in San Francisco doesn’t like raisins. 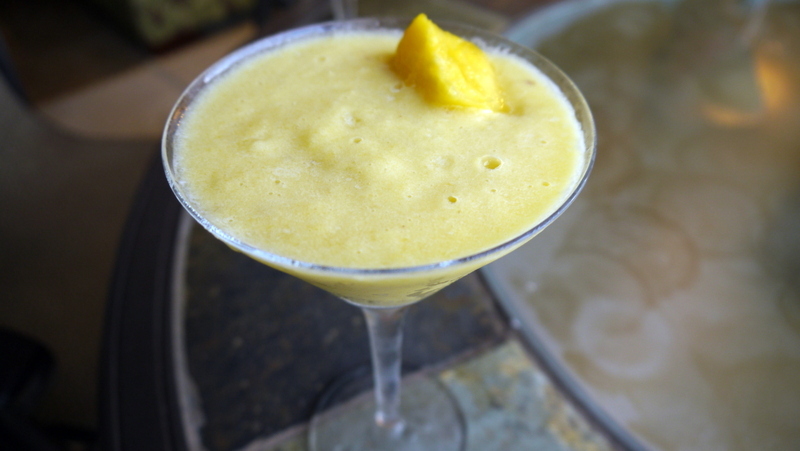 Dinner started with a fresh mango and pineapple smoothie. Healthy treat to whet the appetite. 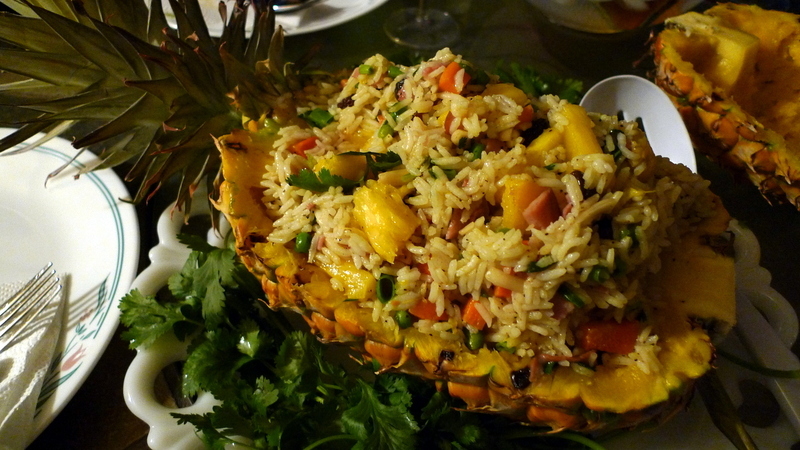 Filling the hollowed-out pineapple with the fried rice. The top shell is placed over the rice and then it is baked in the over until fragrant. A short video of Tawn removing the top of the pineapple! The finished product! It was really tasty. 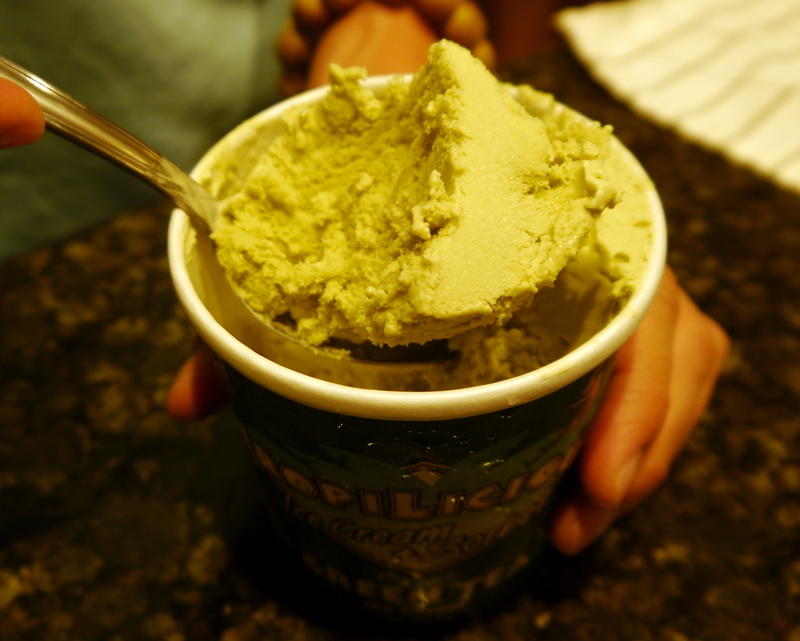 For dessert: green tea ice cream. 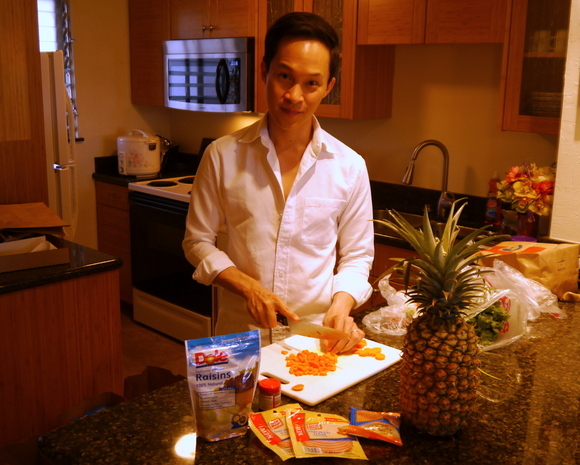 This entry was posted in Uncategorized and tagged cooking, food, fried, pineapple, rice, Tawn by christao408. Bookmark the permalink. Wow — that looks delicious — does Tawn share recipes? “omg are you serious?” hahaha… I love the reaction. Although if you had pointed the camera at me, I would have just jumped over the balcony. I noticed the condo came with a rice cooker! Awesome! LOL i love the video!!! kenny is hilarious. tawn was so cute, he was all excited to reveal the fried rice! looks so fresh and yum! YUM. i thought you’re the only cook at home, chris. i have always wondered if tawn would mind taking over the kitchen once in a while. Excellent presentation. Cute Chef too. Sounds like a very healthy meal. My mouth watered looking at that! MMMmm! Very, very nice. Well done, fine banquet. The video made me laugh! Tawn’s dinner looks delicious and now I’m pining for some pineapple! So, Tawn cooks too? Cool. I wonder where my comment went? I had come here and rec’d it and said how Matt had upstaged me by his comment above. But really Chris, OMG, this is phenomenal, and the pineapple fried rice looks amazing. I see now that I cannot rec the post. Xanga and its finnickiness! Had to go to googlechrome to rec it. hah hah! Green tea ice cream ??? Sound like a winner ! yum, fried rice and green tea ice cream! i haven’t made fried rice in a while. my favorite is kim chee fried rice! @I_love_Burma – @ZSA_MD – Thanks for the recommendations – especially for making the effort to open a second browser, Dr. Z. @kunhuo42 – Kim chee fried rice is fantastic! @catstemplar2 – It sure is. @ungrandvoyage – Your presence at the dinner helped make it so nice. @Inciteful – Indeed he does. While he doesn’t cook often (and is terribly messy in the kitchen, in my opinion) he is a talented cook. @murisopsis – Glad the video made you laugh. @slmret – Does Tawn *use* recipes? That’s the question! Ha ha! @ElusiveWords – And a large rice cooker, at that! @Ikwa – Thanks for the mini! @rudyhou – He does cook from time to time. My schedule tends to be better suited for cooking since all my work is from home, though. @oxyGENE_08 – Yeah, Andy and Sugi were married two Sundays ago. @iskrak – Yeah, Kenny is good for a giggle. @CurryPuffy – @JacquieCooks – It was very tasty, yes. @Big_Bang_Theory – Thanks, it was simple but satisfying. @Fatcat723 – Ha ha – thank you! Dang! I can’t rec. and I don’t know the recipe….. but….I hahf my vays und I vill get it from you! so jealous of you and tawn’s cooking talents!